Andrew Bird is a unique artist and performer. I went into Fever Year knowing very little about him beyond what I’d seen in the trailer for the film, and I left the theater knowing only a little bit more. This isn’t a bad thing however, because I don’t believe Fever Year set out to be a biography of Bird’s life. To me, the film is a window into Bird as an artist, and into his creative process. 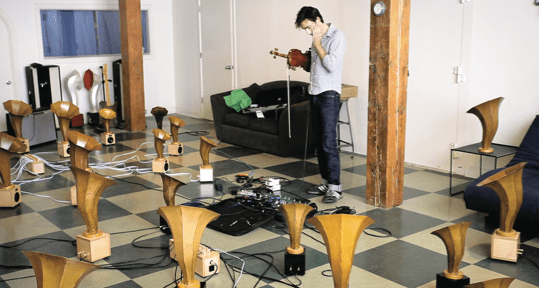 The film, commissioned by Andrew Bird, is essentially a concert film. Capturing a performance at the Pabst Theater in Milwaukee. We go back and forth from him on stage, to practicing and setting up for the show, and even collaborating with his supporting acts. We travel with Bird to his family home on a farm in Illinois, capturing an intimate moment as he develops and records a song – and sit with him as he talks about his life and history as a performer. He’s a unique artist, and I don’t think I can place him in a particular genre. His music ranges from indie rock to folk, and the film does a great job of capturing his performances. Bird combines guitar, voice, whistling, and violin to create a beautiful unique sound that stays with you. Director Xan Aranda’s touch is delicate, we are involved but we are removed, much of the film feels like we are a fly on the wall – watching Andrew Bird exist in his environment. The film is lensed beautifully, the organically shot concert footage melds perfectly with the rest of the documentary footage. Aranda had access to some archival footage of Bird earlier in life, and makes great use of it. Everything about the film fits together with precision. Bird at one point in the film sums up exactly how I felt about this film. His music is very personal, but he doesn’t really like to go into it – his work says everything he needs to and wants to say, and so does Fever Year. Click for a Q&A with Xan Aranda that followed the IFFBoston screening!